Serie V Melanio is the crowning achievement of the Oliva Cigar Company. This high-end Nicaraguan masterpiece is lovingly crafted by a select handful of some of the best torcedors the world has to offer, using aged ligero filler and binder tobaccos from Nicaragua and a gorgeous Ecuadorian sun grown wrapper. Ultra-refined, yet powerful and pleasurable. The first light gives off billows of blue smoke, slathering the palate with a massive dose of ligero spice. The earthy introduction soon turns sweet as hints of coffee and dark chocolate become apparent and the spice further intensifies. 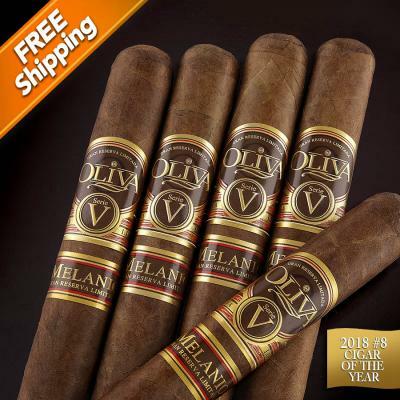 Oliva Serie V Melanio Churchill is a “connoisseur's only” cigar meant for experienced palates. Similar sticks include Padron 1926 and Rocky Patel Decade. Melanio is the result of decades of ceaseless dominance in all things tobacco by the name any true aficionado always trusts—Oliva. Still not sure if you are ready to take the plunge? Try a 5-Pack today!